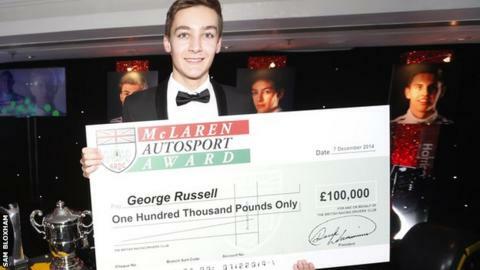 Formula 4 champion George Russell has been named the youngest winner of the McLaren Autosport BRDC Award. The 16-year-old from Wisbech, Cambridgeshire, won £100,000, an F1 test drive with McLaren and membership of the British Racing Drivers' Club. The award, which has previously been won by Jenson Button and David Coulthard, recognises achievements in junior motor racing. "It's very surreal. It's a dream come true," he told BBC Radio Norfolk. "I've been working hard for this for a number of years with the aim of driving an F1 car and hopefully having a career there." Russell, who lives in King's Lynn, and five other finalists - Alexander Albon, Ben Barnicoat, Sennan Fielding, Seb Morris and Harrison Scott - were assessed on their achievements this year and performances in a number of tests, including runs in a GT, F2 and German touring car. This was Russell's first season out of karting, and he won five Formula 4 races on his way to the title, and finished fourth overall in Formula Renault 2.0 Alps series. "It looks like I will be doing the European Formula 3 championship next year," he said. "Nothing is confirmed yet. I've got a couple of tests coming up and hopefully we will have a decision before Christmas."